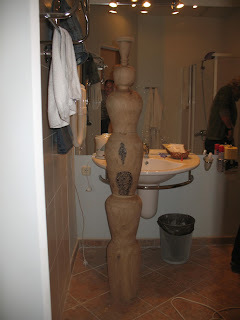 This is the main element of my sculpture, I assembled it in the bathroom of our room to be sure the glue dried before I took it down to the site to do the carving on it. 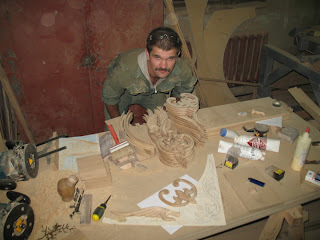 Jean-Paul from Switzerland, he is carving a sculpture here that will be used tonite for his fire sculpture performance tonite. Today was Sunday and another day for cultural excursion. Our bus full of sculptors had a tour of Penza and explaination of the history. The city of Penza is just over 350 years old and known as the cultural capitol of the Volga region. Our tour started with a stop at the school and gallery of childrens art, then a monument to those that lost thier lives in wars and the church next door where many of us purchased candles and left in the shrine. We also went to the performing arts centre where the Penza Philharmonic put on a private performance just for us.....wow!! what a show. The Penza zoo was another stop where 3% of the worlds Amur tigers have been born now. It was a wonderful day and as usual I took 100 photos along with video of the musical performance. When I got back to the hotel I erased them all by mistake, good thing I download them each day or I'd have lost more. 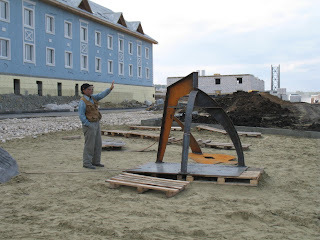 Tommorrow is the last day of the symposium, I only have to add the color that I plan to use and assemble my sculpture with the crane, should be finished by lunch time and spend the rest packing and taking pictures of me with other sculptors which was kind of my project today. Here I am at one of the galleries in Moscow with one of the official casts of a famous sculpture by Rodin. 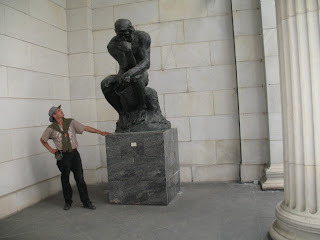 I think most people will recongnize it " the thinker"
Saturo Takata pondering his yet to be assembled piece. 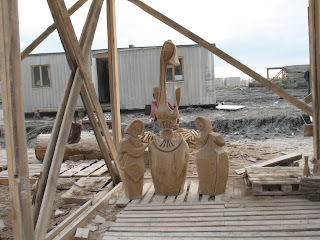 About half of the sculptures are wood, this is one that was finished quite early on. It has been a great time in Penza so far. 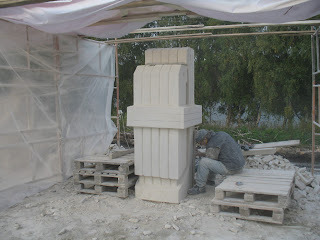 My tools were stopped in China and didn't come for a week, that was fine as I think I have lots of time to get my piece done and this gave me a chance to help others. 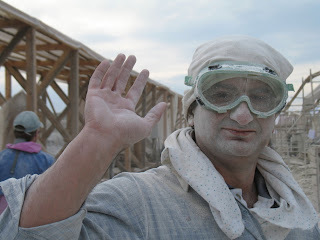 I cleaned rubble from a lot of sites and assisted Pierre from France and Barbara from Poland for pretty much all of the first 9 or 10 days, up until the 19th I guess when I went to look at the lathe and buy some stuff I would need like sandpaper etc. The hospitality has been awesome, the food is terrific and there is live entertainment during and after supper every night. 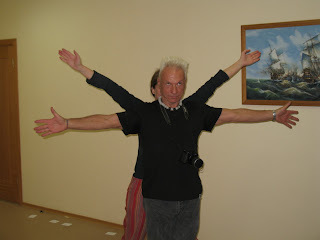 Each Sunday we go on a tour of some kind, into Penza or around the province of Penza. 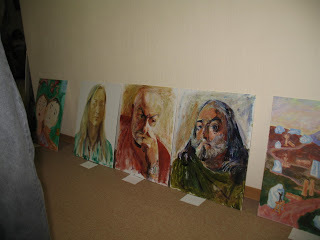 It is the cultural centre of the Volga region and rich in art. Everywhere we go the bus is lead by a Police car with lights flashing and siren going when he passes vihicles. I can't believe it but they sure have a different reaction to visiting artists in Europe and Asia than back home. I do see the point, works of art are being created that will be enjoyed by the public and add to the culture here for centuries and more. I think to most of us we are just happier than ever to get together and create art, talk long into the night about it, enjoy each others company. That formula sure worked in Bergen but I do hope that in the future even more of the public will come out and see the process and the development of the sculptures. That only happens once. Back to work today, burned out my drill right off the bat. Will have to get a new one tomorrow, now time is getting short so I’ll have to work hard the next four days. Time kind of snuck up on me here, I couldn’t get on to the lathe for the first week and ½ and now with a few little problems coming up I can see I will finish just in time. 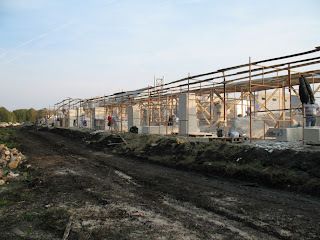 Would be nice to have a few extra days to tour Penza etc but I had a lot of fun helping others where I could during the first period of time where I couldn’t begin my work. 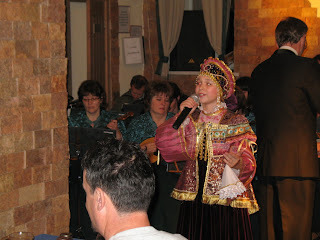 There has been entertainment every night so far, children dancing and playing instruments, traditional music and dancing, classical music, a man whose voice blew everyone away……if I can figure out how to put video on my blog I’ll do that otherwise pictures will have to suffice. Seems every night it all ends in a social event happening somewhere, at the pool, in someone’s room or the dining room etc. Having the time of my life again as always seems to happen at these symposiums. I have gotten into having everyone sign my hat with a felt pen as a memento, today I got that done at lunchtime, only missed a few. I brought an extra hat for the gig in Viet Nam, so two new hats for the wall on this trip. 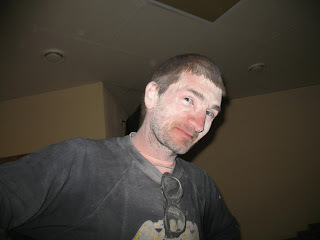 This is my neighbor at the work site, Immonen from Finland. 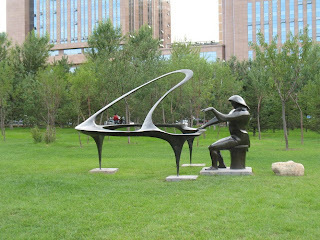 I love his sculpture, conveys a sense of grace, beauty and love. 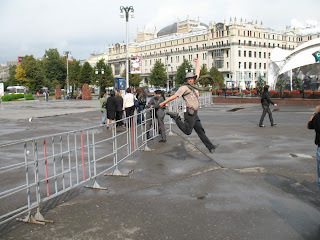 Perfect for the theme of this symposium "family"
Here, I am just outside of Red Square in downtown Moscow. This evening 50 of us will ride the bus to Penza 600km southeast of Moscow. 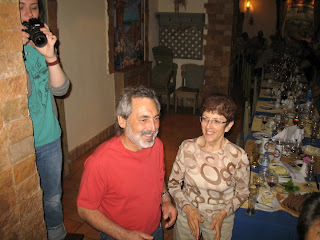 About a dozen of us came into town from the airport to see some of the sights. Morton and his interperator in the park. The closing ceremonies, a beautiful banquet and saying goodbye to old friends and new. 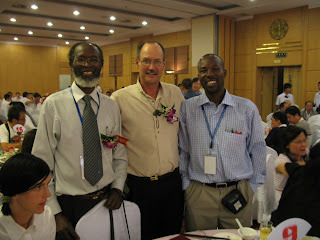 Friends from Kenya , I will be working with the nephew of the man on the left (Matundi) in this picture when I get to Russia in a few days. Small world isn't it? 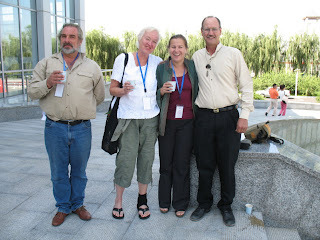 First day of conference in China, many interesting and informative presentations were given. I was glad that when wearing the headset provided they were translated into english or the language of your choice. I didn't try any of the others. 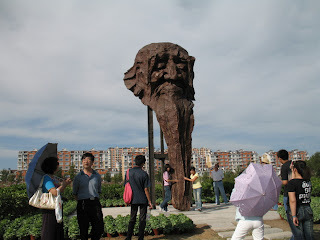 A huge bronze, the sculpture park here at Chang Chun is the largest in the world. It has more than 500 sculptures, most of them in stone or bronze. I have never seen so much bronze! There were thousands of people in the park. It also boasts the largest sculpture museum in the world, 12,000 sq meters....well Chang Chun is doing it up right and I think it will be a very long time until another place can develop anything that compares. 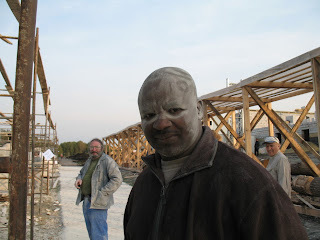 Dana O'Donnell from USA, gettin' dusty. Entertainment has been incredible as I've probably mentioned already. I think this is the third time that very talented young musicians have put on delightful performances. The organizers have really done it up right for this symposium, you can't come to Russia and not take in some classic Russian music. I can't get enough of that but not complaining when they have a jazz band or rock and roll or..........what a great time!!!! No work today, there was a painting contest instead. I have never painted anything but a fence so it was pretty intimidating but I gave it a try and had a lot of fun. The work that was produced in one day here is amazing, three prizes were given….I didn’t even bring my painting down for the judging but I did discover that I like to paint. My painting is alright but doesn’t hold a candle to the others. 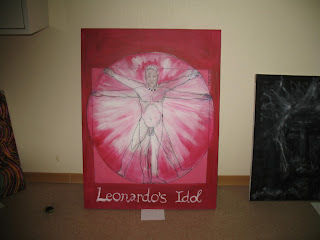 The model for "Leonardo's Idol"
Everything went smoothly today, I got in to the factory about 8:30 this morning and was finished turning by 1 or so. The rest of the day I visited with Andre and Demitrie, we shared woodworking tips and talked about fishing and just about everything else. I expected to pay for the time I spent on the lathe but when I offered that they shut me down and came out with the fanciest bottle of cognac I have ever seen. It is a hand made bottle in the shape of a sword with engraving and all on it. Seems I’m the one being paid here, big thanks to those guys. Demetrie and Andre, the guys from the wood shop that were nice guys and very helpful, they were very interested in what I was doing. We traveled to a monastery about 150km from Penza today (police with flashing lights leading us all the way, ha ha). The building and grounds are beautiful and interesting. After a meal at the monastery we traveled a few km to some caves where the monks once lived. There are many km of caves in this mountain, you could easily become lost. Each of us held a candle for light, what a place to live! 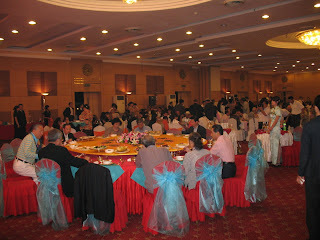 Nothing out of the ordinary yesterday just more wonderful food, traditional entertainment etc. The music is so much fun to listen to and the costumes are incredibly ornate. We all end up dancing every night. Today I was surprised that for breakfast we had caviar and ice cream drumsticks. Sweets are common fare at breakfast in Russia, including chocolate bars. 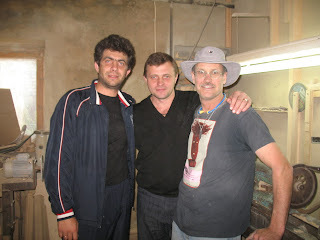 I went in to Penza to see the lathe I will use, starting on Thursday, I think I will only need one day to do the turning on my sculpture. 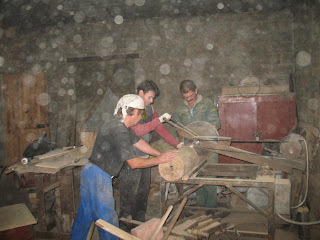 As the lathe is not large enough to handle my wood, (70cmX2m) I had to prep the log for tomorrow. I didn’t expect this so I didn’t bring a chainsaw. Thomas from Slovenia lent me his and in a couple of hours my material was ready to take to town. The wood they supply is oak, I’ve never worked such a large piece of oak before. There is lots of it here, I don’t think it is such a special material as it is at home. Well in Viet Nam they make floors in sheds with teak. 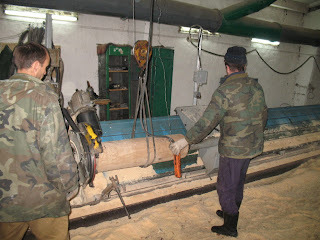 At the woodworking factory we realized the lathe isn’t quite big enough to handle such a large piece. They assigned one of the workers as my assistant and told me anything I needed him for to just go and get him, Eugene is his name. The owner, Demitrie and Andre really went out of their way to help me get going. We went to two other factories that have lathes but still not one large enough so I decided to reduce the size of my sculpture so that I could get going on the first machine. 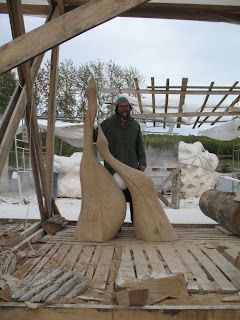 A truck came and we took my material to a place that makes log homes, there they reduced the size to 26cm diameter which will mean I have to make a shorter sculpture if I want to keep the same design that I intended. That’s part of the symposium thing, tools, material, weather, sickness…….can all affect what you may end up being able to do. Sometimes you have to modify your plans because of something unexpected. I started to work about 4pm and finished around 8, will have to come back tomorrow. Today was the opening of the exhibition at the art museum in Penza, I brought a piece titled "Ice, Wood and Fire" It is a turned sculpture with wood, metal, glass and light elements. 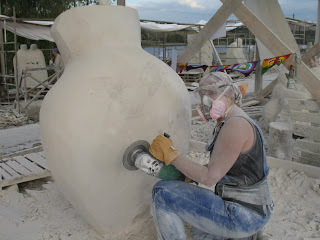 Interviewed with my piece by TV and lots of pics with it by attending public and other sculptors. All very nice but like everyone else I think we’d just about rather be at the site getting dirty and working on our sculptures. Well, I guess there is time for that too. Really an enjoyable day and just soak up the experience as it develops. After the museum a tour of the college of art* Our bus is escorted everywhere by police with lights flashing and sirens at the intersections. Even stopping traffic at the intersections, hmmm this is really cool to say the least. 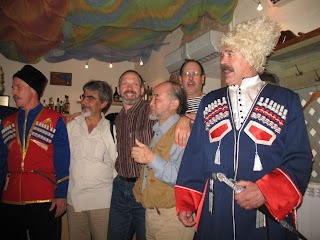 During supper (which is a real spread) entertainers in traditional costumes thrilled us all. 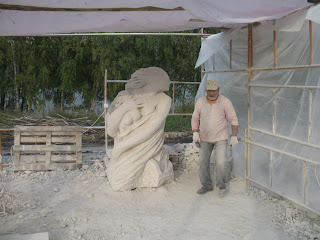 When I can I’ll get some pictures up about that kind of stuff, you can only put on so many photos of sculptors sculpting. 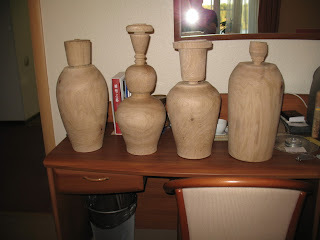 Begin sculpting, as I need to do a lot of work on a lathe at a factory in Penza and I won’t get to use it until next week I assisted the reps from France and Poland. 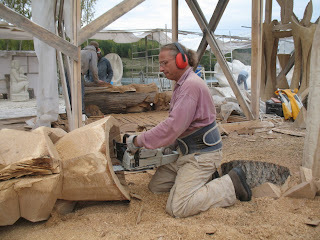 They are both working in stone so I get my hands onto stone and wood in this symposium. 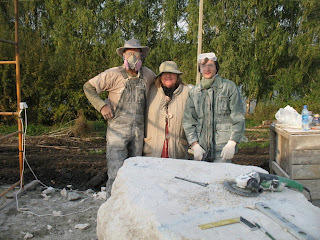 Stayed busy where I could see a little help was needed, cleaned rubble from the work area for several other sculptors. Making fast friends as we all do invariably. Some of the sulptors hired assistants from the college of art who were given time away from classes to work at the symposium. Bonus! 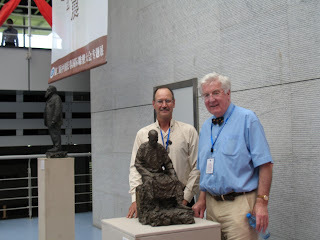 they got to have fun and work with sculptors from around the world, got paid a little and didn't have to sit in class. We got some much needed assistance with the bull work. I assisted Barbara for most of the first week as my tools were held up in China and I really would not have chosen to do anything else. Rode the bus all night to Penza, 650 km south east of Moscow. I think by midnight everyone was asleep. We had so much luggage it wouldn’t all fit in the cargo compartments so we had to walk on the armrest to get out of the bus at stops as the isle was piled high with luggage containing mostly sculpting tools of every kind, what a howl. We arrived in Penza at about 10am, a beautiful breakfast was waiting for us. We ate quickly as we are all tired and the opening ceremonies is at 2pm. After a little sleep we went to the opening, the minister of art and others were there along with lots of TV and other reporters. They are really making a big deal about this event. Flew Changchun, Bejing, Moscow today for the symposium in Penza. The organizers meet me in the morning and since I arrived in Moscow late I just found a good bench to stretch out on and get some sleep. By 6 am I am walking around the airport, Akmed spotted me as a sculptor and by the time we met with Valentina we had a group of about 10 sculptors sitting around sharing stories and coffee. Off the downtown Moscow as the bus to Penza doesn’t go out until about 9 or 10 tonight when all 49 of us are here. 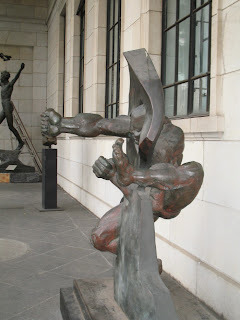 The metro (subway) was a real thrill but nothing compared to the architecture and art in the downtown. 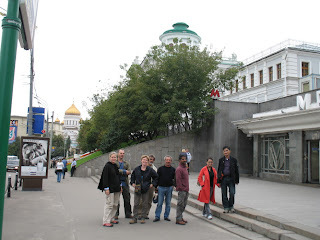 We did a walking tour of Red Square, the art museum……and had lunch at McDonalds. Ha ha ha, lots of traditional fare to follow I’m sure. Spent the morning at the conference, with 3 screens behind the stage most presenters had photos to accompany their speeches. Wow, I am blown away! My interpreter, Cherry, meets me every morning in the lobby and keeps track of me until bedtime. 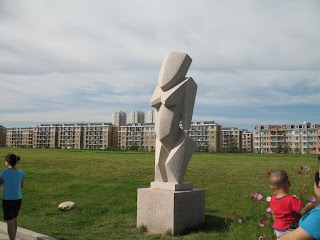 Without a baby sitter for each participant I’m sure there would be a lot of lost sculptors to find at the end of everyday, Changchun has a population of 6 million. Up early for the conference, met several people I didn’t know during breakfast and made many more new friends throughout the day. 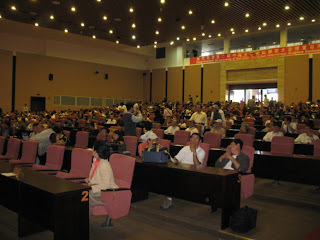 The conference hall is set up theatre style with the seating descending to the stage area. Simultaneous interpretation in 3 languages allows almost everyone to hear the speeches as they are made, we all got a book of the speeches so we can go back and reread the ones that were of particular interest or ones that we missed. 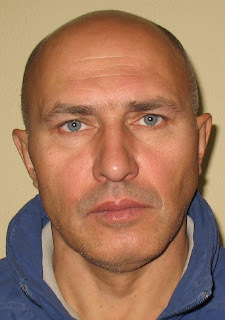 I met some people that I will see in Penza later this month or who know people that will be there. 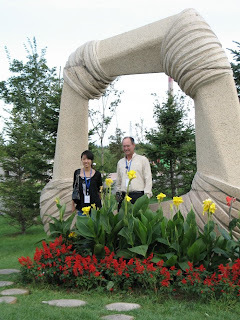 On September 5 I flew out at 6:30am for China, arrived in Bejing and flew on to Changchun. The hotel is beautiful. 129 sculptors, architects and government officials representing 120 countries are attending. In total there are over 500 participants at the conference. Each attendee is assigned an interpreter which is wonderful, allows us to do things at our leisure, well at least some of the things that we would like to. The presentations are informative, inspiring and interesting. 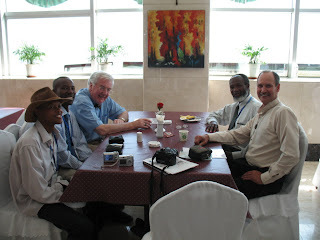 3 delegates from Canada made presentations including my friend Jock Hildebrand. Well, now it is Sept 22 and it is obvious to me that I will not get this blog updated the way I would like to on a daily basis. My internet connection does not work here in Russia, it takes too much of my time trying to keep up and I’m not being successful anyway. The difficulty is photos so I will just do a daily text update and fill in with some pictures when I can get on the net with my own computer, I hope that will be when I get to Viet Nam. I have so many nice pictures I would like to share. Here are some shots of the sculptures completed at Bergen Rocks, commentary re: China, Russia and Viet Nam follows.